1. Fifteen email-etiquette rules everyone should know via Business Insider. 2. The stigma of doing things alone via Huffington Post. 3. Thirty-eight pairs of shoes that look expensive via Buzzfeed Style. 4. 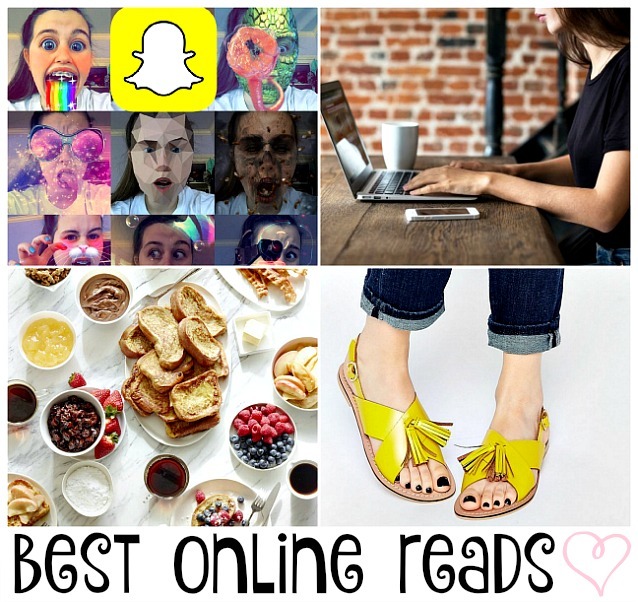 How to Snapchat like a teen via Buzzfeed. 5. How to overcome worry and become a friendlier person via Jocelyn K. Glei. 6. These apps drain the most battery on your phone via Redbook. 7. Can you use a regular rug as a bath mat via Apartment Therapy. 8. Host a brunch for friends complete with a French toast bar via What's Gaby Cooking? 9. A peek inside the world's most friendly dog office via Inc.
10. The best coffee shops to work in in New York City via TravelSavvy.